It is just the right thing to do, to open the world women’s conference by such a mighty march. Women worldwide are standing up to struggle for their concerns. Hundreds of Nepali women in wonderfully colored dresses welcomed us at the meeting point. We successfully fought for the entry of women from Syria with the help of Nepali Minister of Foreign Affairs just the day before. In Syria the women had no possibility to apply for visa due to the war going on there. Also the day before, Shamla, a young German delegate born in Afghanistan was stopped at the airport of Katmandu and forced into an airplane going back to Dubai with the hair-raising reasoning that her passport was not readable by machine. This happened despite the fact that Shamla had a valid passport and a valid visa. Immediately a political offensive started in Nepal and in Germany. A letter of protest by the Asian Coordinator of WWC, Durga Paudel, a member of Nepali Parliament as well as a letter of Nepali Minister of Foreign Affairs was sent to Dubai. African delegates adopted a resolution of protest and a loud march across Katmandu was organized. Unannounced, in the middle of the road, well protected by our own chains of women security guards, the march went across Kathmandu. We could learn a lot about music and creativeness from our African women. The slogan “We want Shamla in Nepal!” was performed as dance and song. 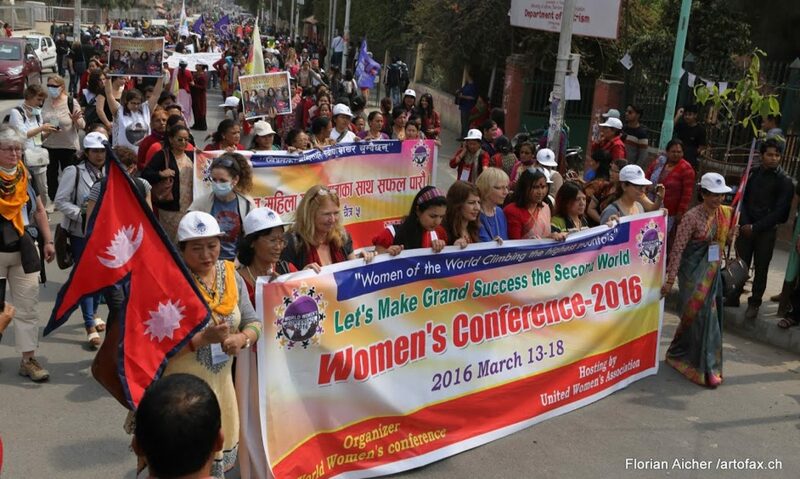 Our march was led by the Asian coordinator Durga Paudel and the European coordinator Monika Gaertner-Engel. It did not last long and the police came saying you cannot come along and just organize a march. Durga Paudel answered: We will not accept that delegates of WWC will not be admitted to our country! So finally police led our march and protected our manifestation (see our video of March 12th). Halinka Augustin, European Coordinator from the Netherlands, could finally announce today: Our protests and our march were successful! Yesterday we claimed: We want Shamla in Nepal now! Today she will be here! The opening march was framed by Nepali Women. African women were singing and dancing. Militant songs from many different countries were sung. Women from 4 continents presented themselves and their movements and organizations by microphone. A multicolored flood of banners and flags was taken along representing International Women’s Alliance, unions, YPG, SKB, REBELL, Courage, ICOR/MLPD, Gabriela Philippines and many others. Among many creative banners there was one designed by Kurdish women saying: ‘From the mountains of Kurdistan to the highest mountains of the world! Women’s radical struggle for a free life’. The need to organize became visible as well as the need to struggle for liberation of women and international revolution. Also the pride of the women became obvious who were greeted and respected by many thousands of spectators along the streets of Katmandu. The raising for funds, the struggle for the entry of international deputies, the opening march and ceremony have developed an atmosphere of lively sisterhood and creativeness, fighting and team spirit, mutual responsibility, right from the beginning, when the first international brigades started to prepare for 2nd world women’s conference.